Week 3 of the fantasy football season is here. I’ve got most of my bankroll allocated toward MLB and CFB at the moment, but I always take a few shots in the GPP’s since some sites have some overlay. Drew Brees is out, which give a bump to Panthers DEF usage rates. Falcons RB Tevin Coleman is out. Full injury report at Rotoworld. 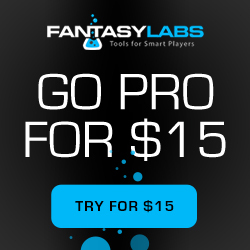 FantasyLabs just released an new app. Rotoworld posted a detailed worksheet worth reading about the Week 3 matchups. Draftkings posted an array of articles & analysis here. Dynasty League Football posted contrarian plays which are useful in large GPP formats. Rotocurve posted NFL Player Projections. Draftkings posted Week 3 WR Rankings. Rotoviz posted projections for every position. FantasyWired posted week 3 value picks on fanduel. FantasyWired posted Week 3 value QB picks on Draftkings. DFSRoundtable posted week 3 WR money saving picks and value plays at RB. Dynasty League Football posted bargain players on FanDuel. Yahoo posted deep sleepers & value plays on Yahoo.